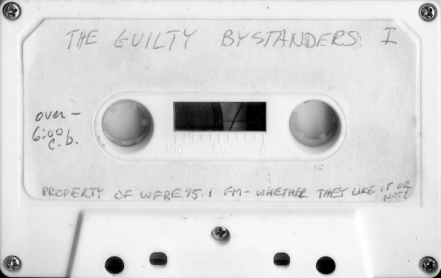 This was recorded in the first few months of the band's existence with the intent of sending it in to WFBE's "Take No Prisoners" radio show for airplay. The first tracks aired in the Spring of 1983 and the band would continue playing for decades to come, becoming the longest-running band in the Flint underground music scene. "We already had a beat-up Sears acoustic guitar on which we learned to bash out a few basic chords. Although we didn’t know it at the time, we were a band already waiting to happen. All we needed was a bass and an excuse to write a few songs. As I mentioned earlier, the bass was supplied by Teresa Bigelow, a friend I knew from my days at Fenton High School. I still recall that the large red off-brand bass didn’t have a case, so I wore it over my shoulder on the two mile trek back to my house. I felt like a rock god. As soon as I got home, I sat in front of my brother’s Yorx cassette deck and got ready to record a few experimental bits with bass & guitar overdubbed. Although the audio quality of that deck was substandard, its dual-deck design was such that overdubbing was ridiculously simple: all one needed to do was to plug things into the microphone inputs while dubbing the original tape onto the second tape. Voila! Instant overdub! When deciding which song I should attempt recording first, the choice was a simple one: a rendition of “Should I Stay or Should I Go” from The Clash’s “Combat Rock” album. This particular choice was not simply because the song was popular at the time, but also (and mostly) because it had a basic guitar and bass line simple enough even for my very limited talents. After some fiddling, I managed to produce a passable – if uninspiring – version of that song. That was nice, I thought, but I wanted to do more. Before proceeding, I played the results of my work to Steve. He listened politely, but didn’t seem too impressed. We decided to work on a project together. By that time, I was thoroughly bored with the Clash number so something new was in order… but what? Well, at the time PiL’s “Metal Box” was (and still is!) one of my favorite albums, with its heavy repetitious bass, sparse drums and… well… “weird” guitar. Thus influenced, I came up with a suitable plodding and repetitious bass line. Handing the bass over to Steve, he repeated it over and over while I dinked around on the guitar. I had originally attempted some avant-garde guitar noise, but the hopelessly cheap acoustic guitar combined with my musical incompetence convinced me to abandon that course in favor of good old slammed-out chords. So far, so good. But just repeating that over and over was kinda boring. Hmmm… how ‘bout a change we thought at the same time. After coming up with something based on the few chords I knew, we had the skeleton of a workable song. But something was wrong. What was intended to be a radical PiL-influenced tune had, by our absolute musical ineptitude, ended up sounding like a goddamned country song! Inspired by nothing as much as impatience to record an actual original song, I resigned myself to fate and scribbled some quick lyrics describing my impression of followers of that particular musical genre. Within several minutes, the song “Shithead” was born. I rolled the tape. The date was March 20, 1983. At that moment, The Guilty Bystanders sputtered into existence. So there we were. Seven songs were recorded. Now what? Again, the answer was simple. There was a weekly radio show called “Take No Prisoners” on WFBE hosted by Ben Hamper and Jim McDonald. They played all sorts of noisy and strange stuff. On any given program, one was as likely to hear the Dead Kennedys as Annette Funicello. Best of all, they had been known to play local music from time to time. This was our chance! But what would we call ourselves? I suggested “John O’Cyde and the Guilty Bystanders” I would be John O’Cyde. Steve objected. He didn’t want me getting top billing. Very well, then. How ‘bout just the Guilty Bystanders? Agreed. Funny thing, though. Even though the first suggested band name was withdrawn immediately upon Steve’s veto, he has complained about it ever since. Over a quarter-century of griping over a name that was seriously considered for about a quarter of a minute. Little brothers can be so annoying. Anyhow, Steve then adopted the moniker “Captain Crunch”, we dubbed the seven songs onto a cassette, enclosed a letter and on April 12, 1983 we sent the tape to WFBE. Then the waiting began. “I rushed the cassette home to examine over many tall cans of Budweiser. The tape was obviously a low budget creation, hissing & groaning & crackling through the speakers like some outtake of ‘Paul Revere and the Raiders Play the Urinals at Candlestick Park’. The bass guitar lurched around the room like drunken thunder. The guitar was acoustic (!!!) & sounded hopelessly buried behind walls of drone. The percussion seemed to be two curtain rods snapping on top of Styrofoam coolers. The angry vocals rumbled right on over this chaos alternating between a teenage drawl and a phlegm-coated screech. Graced with such a favorable reaction, we got our first bit of airplay (“Apathy Song”) on April 15th, 1983. Steve and I were overjoyed. Hearing ourselves on the radio was cool as hell and we wanted more of it. What followed was perhaps the most insanely productive month in the history of the band."